This bizarre, micro-budgeted sci-fi/horror film reminiscent of the 1980s classic LIQUID SKY, focuses on a young woman who goes to a job interview, only to be held captive by two mysterious cult followers and kept prisoner there to serve the alien leader -- incarnated by a deformed, armless mannequin in a robe who communicates telepathically with a voice that sounds like it's coming from an old ham radio. The girl is forced to serve as a prostitute for the pleasure of the cult's many male followers, and one of them -- an elderly burn victim who wears a black hood -- impregnates her, so the cult keeps her there to carry the baby to term, at which point she also becomes the mannequin alien cult leader's chosen follower. A fascinating and weirdly engrossing tale. AF: What was your inspiration for making the movie? EA: I really enjoy watching movies from the 70’s and also many TV shows, such as ‘Charlie’s Angels’, which is about a group of cop women who have a boss they never actually see. For ‘The Sect’, I thought it was a cool idea to create a sort of opposite to all that, a wicked and mysterious character with an unknown identity who is also the leader of a cult. This sect is not set in a distant place but in the middle of a big city, and it is financed with human trafficking, and that’s what Kalima, the main character, faces from the beginning. My focus was on leading the viewer towards a strange world with something dark in it, but also bizarre elements which lead to something almost funny because of its strangeness. This world can be found behind the door of any building in any city. I was always attracted to the idea that everyday life can turn into something threatening. We use to think that we are safe living in a big city surrounded by lots of people, but I feel that it is in the big city where we become invisible and therefore more helpless. What I found attractive about the project was not only telling a horror story but also dealing with creating a dark, strange atmosphere with many bizarre elements which also deal with comedy and the absurd. I wanted few lines of dialogue, we had very little budget and only a few days to shoot the film. It was a great experience. AF: To what extent is your filmmaking affected by where you live? In other words, would you tell the same stories if you lived somewhere else? EA: I think that my filmmaking is very much affected by the fact that I live in Buenos Aires, a big city with a great and wide cinematic culture. I have watched movies from all over the world since I was a kid. Here in Buenos Aires we have lots of fans of Woody Allen, for instance, and there were times in which his films and also many European films had a wider audience than traditional Hollywood films. Doubtless having grown up in a different city would have definitely affected the way I make films. I would have missed the opportunity to understand cinema as a phenomenon dealing with concepts and ideas, which is a point of view more close to European and American independent cinema. The fact that Buenos Aires is full of Cinema Schools and big theatres is also very important. This is a fundamental issue when it comes to independent filmmaking. 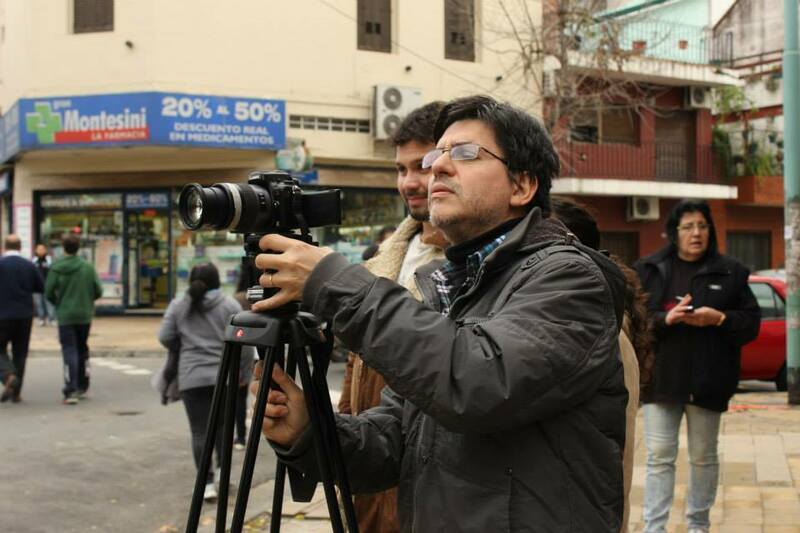 On the negative side, living in Buenos Aires implies that you do not have access to big budgets such as in the US or Europe, and this issue plays a big part in the type of films you want to make. Budget constraints force you to solve important issues based on the few resources you have, which is a very hard but also interesting creative effort. AF: Have you noticed the new trend of “female empowerment” in today’s action/horror films, and to what extent was your character “Kalima” crafted from that mold? EA: To be honest, we thought of Kalima mainly as a working class girl who comes from the country. Here in Argentina, people in the country don’t have many economic possibilities where they live and they come to the big city in search of a brighter future. This is harder when you are a woman, because it is really difficult for women of the country to get a job in the big city. That was our starting point with Kalima. She never took anything for granted, her life was a daily struggle and that makes her kind of a fighter. I hadn’t really noticed there is new trend of “female empowerment” in today’s action/horror films. I think that may have to be, with how women feel nowadays about gender issues, which is a very important matter all around the world. As the great Roger Corman once said, genre films usually express a second point of view which deals with issues that go on below the surface of society and that we cannot directly see. Ernesto Aguilar is an Argentine film director, born on June 6, 1971 in the city of Buenos Aires. His early passion for movies led him to study film, and since the late 1980s began to direct, produce and write short films. His films, which have covered topics of the most diverse genres, usually offer a very personal approach, containing sometimes surreal elements that have made many of his works in unmistakable signs of his characteristic style. He is a prolific filmmaker and his most recent features (all 2015 releases) include El Maltrecho, Revolución Piquetera and Necromancia.